This weekend is Canadian Thanksgiving and we have my in-laws coming for a visit. As I prepare for their arrival this weekend it reminded me of some guest room photos I took when they came to visit last Christmas. I never did share how we prepare my daughter’s room for their stay. We don’t have an official guest room but my daughter graciously gives up her room when we have visitors. I like to make guests feel as comfortable as possible when they come and try to anticipate their guest room needs ahead of time. 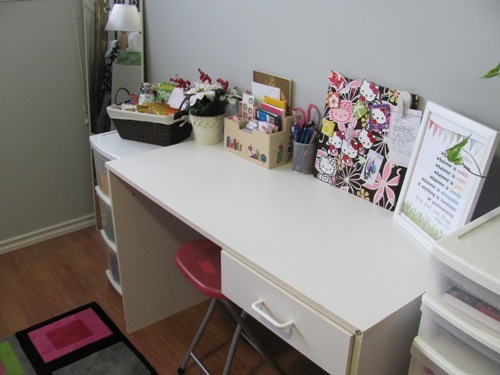 Provide somewhere for guests to lay a few of their things out if needed or even set up a laptop or other electronics. 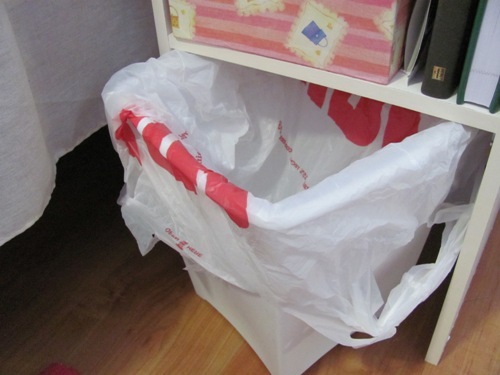 It’s a good idea to try and clear as much of the clutter as possible so guests don’t feel like they are suffocating. A clutter free space is a relaxing space. I always bring any unused toiletries home from hotel stays. They really come in handy when you have guests who may have forgotten something. Plus don’t forget to include some facecloths as well! Make space available in the closet for guests to hang their clothing if they want to. Since my guests don’t have their own bathroom and have to share with my two older kids I like to provide space in their room for their towels. This way they know that someone else hasn’t used them by accident! A couple of Command Hooks on the back of the bedroom door take care of that. I don’t want my guests having to get out of bed to turn off the light so naturally bedside reading lights make sense. Since my daughter normally has the bed pushed up against the wall we move it out in order to make it easier for two people to share the space and brought in an extra side table with light. It doesn’t have to be fancy, just shop from around your house. A room that normally belongs to a teenager needs all the help it can get 🙂 Please be mindful though of any allergies though. If your guests will be sharing a bathroom, they may want the convenience of getting ready in their bedroom. I always make sure they have a mirror (and stool to sit on) just in case they want to do hair and makeup in there. Last but definitely not least, is to make sure some extra outlets are available for guests. Often they will have phones and e-readers to charge, laptops to plugin and perhaps blow dryers and straighteners. If there isn’t sufficient outlets available make sure to include an extension cord or power bar. Bonus: Don’t forget to provide your guests with the Wifi password. I find guests don’t like to ask for things and instead will often just make do in order to be nice. However if they don’t say we don’t often know what they need. For that reason I like to cover as many bases as possible by adding as many extra touches as I can think of. 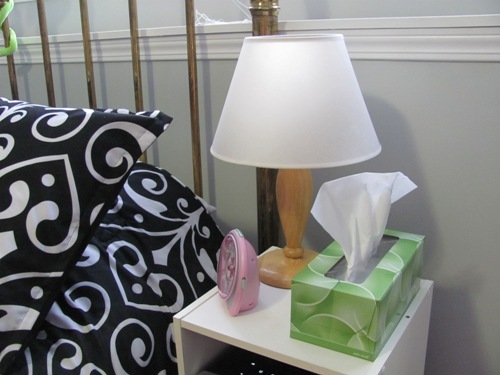 These little details will go a long way in making your guests feel comfortable and welcome. 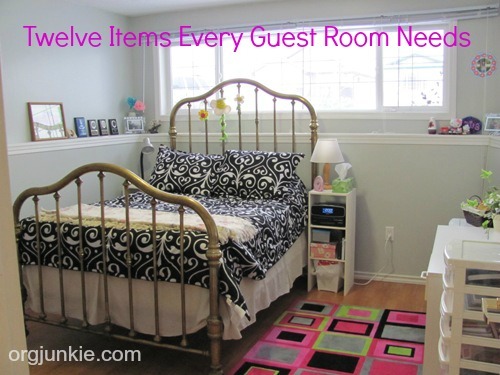 What else would you add to this guest room list? You’re so thoughtful Laura! I love all these little touches and I’m sure your guests do too. I’ve never thought of snacks before – but you’re right! 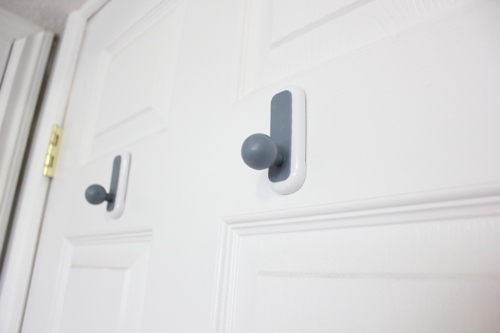 They aren’t going to feel comfortable routing around your kitchen on their own. This makes it so much less awkward for them! 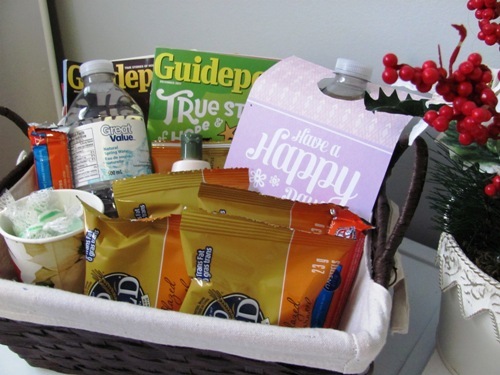 Definitely need to put a snack basket in our guest room! Oh so glad I was able to help! We have a guest coming for Thanksgiving as well. Still deciding where to put him. LOL. These are very welcoming ideas, Laura. Yes we do quite the shuffle here. My daughter takes over my youngest son’s room and the two boys bunk together. I make sure there is a night light in the room, or in the hall so they don’t have to bump around in the dark at night. Also, an alarm clock in the room. Yes we have night lights in all our hallways for the kids so it definitely benefits our guests too! Very nice! 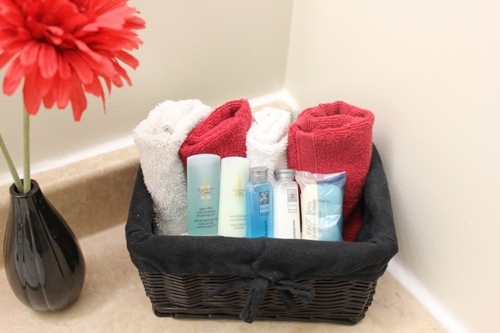 It would be easy to throw a new toothbrush in with those toiletries, too, just in case your guest forgot theirs. Whenever we stay at a motel that have those little bottles of shampoo, conditioner and lotion, along with soap, I’ll bring the extras home and have made a drawer along with a small bowl on the sink with these and I pick up tubes of travel toothpaste and I pick up toothbrushes that are on sale and have those available. I also have safety pins, and cotton balls out too. All of these others are great ideas too! I love this! So helpful. These are all things I notice when I’m staying places but don’t think about when I’m prepping a room. Great ideas~! Thanks for these tips:) I had never thought of a snack basket, but can totally remember being ‘hungry’ as a guest before. I would add alarm clock to the list as several times we’ve stayed somewhere without one and it is very annoying! If company is coming to stay over a longer period I would include all phone numbers for all family members, and a small list of local places to eat, like coffee shops etc, with maybe a basic map and directions. I know when my dad comes over from England he often likes to go walk about, so we don’t feel pressure to entertain him 24/7. Great tip about the food basket, never thought about that one. Love your list. I also add an alarm clock. When I visit my parents, I am always looking for a clock. So, I make sure to include one in the space my guests will stay. Thanks for the idea for the snacks in their room. great ideas!!! i’m definitely going to implement some of these in my new guest room! You think of everything!! Love your blog. Will definitely say THANK YOU for #9! Having been that guest that was wedged between the bed and wall too many times, I can’t stress how important it is to have two options for getting in/out of bed when there’s two guests/bed! Now the question is: How to get guests? Invite! Then make them comfortable and they will come back! I am replying to my own comment instead of the one below, because I’m not sure if it’s a real comment or a spam. If it’s real, I don’t know what that is. I would include a small toothpaste, toothbrushes, disposable razors, and other travel size toiletries. I actually keep those things under the sink in a box labelled “for guests” and just let them know it is there. A map with key things like drug store and grocery store might be helpful. great ideas and thanks for sharing. We have some space in my husband’s office for a guest. Don’t have many people staying here. Usually just one and we bring out the air mattress and sleeping bag and blankets. I’d love to get a rollaway bed but it’s not happened. For guests who stay for several days I always give them their own laundry basket. 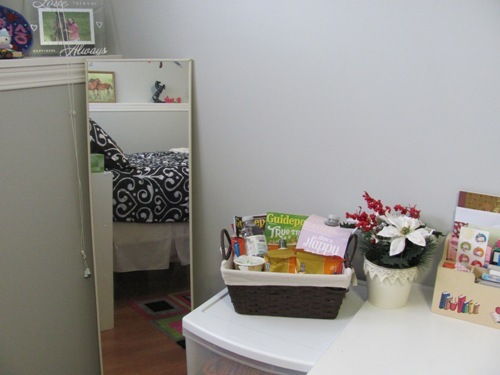 They have somewhere to put dirty clothes and an easy way to transport it to the laundry room! I’ve considered the food basket, but always decide against it. Our “guest room” is actually my daughter’s room (she bunks with someone else when we have guests), and she has a severe peanut allergy. So – I hate the thought of any food in her room. But wouldn’t it be better–safer?–if YOU provide peanut-free snacks for your guests, rather than for them to “sneak” in something that could possibly cause trouble for your daughter? Or at least put a notice on the door so they are aware of her allergy. Ditto! I[‘m that person. Better to have a small can of room freshener the person can use if they wish. Good options at dollar store for one dollar. 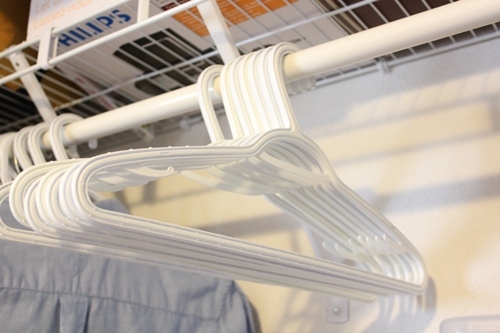 Re hangers: include regular hangers, pants hangers and skirt hangers or clips. With the exception of the air freshener (for those of us who have trouble with scents), love the ideas. The bedside reading lamp is sooo important. 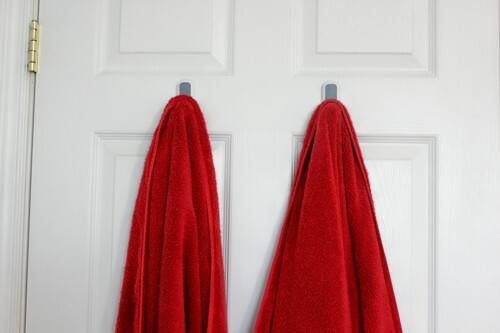 If you put towels on hooks behind the door you might want to mention to guests as I’ve been a guest in places where they do that and I never notice they are there (after air drying my face by an open window) haha. Okay great website, thank! Will follow along. I read every night in bed so the bed side lamp is important to me. When we visit our daughter, she and her husband give up their room to us and they take the blow up mattress. BUT, no lamp. I bought her one and put it in the room, but she needed it in another room. Now, I download a book on my iPad and read from that. Love this post. I traveled in singing groups when I was in college, and after being in hundreds of homes, I can certainly relate to some of these things! A couple things I would add…once you get the guest room cleaned and ready, DO NOT let your animals in it! Once I had to take the comforter completely off the bed because it had so much animal hair on it, and another time I pulled back the blankets only to find a wet spot in my bed! Keeping your animals out is so important! Also, be sure if you are giving guests new towels to wash them first. Otherwise, I’ll tell you why your guests spend so much time in the washroom…they are picking fuzz off their entire body, haha! Nicole I’m with you on the new towels, i had blue ones that left fluff EVERYWHERE. Love this post and your wonderful ideas! I’d add an alarm clock, reading material (I save magazines for this purpose), and a nightlight, and I’d do away with the air freshener (as many are allergic or sensitive). I personally thank you for the outlet suggestion—I use a medical device that requires electricity and it’s embarrassing to have to ask my hosts to move furniture or even, heaven forbid, relocate me b/c there’s no outlet. I love all of your ideas! 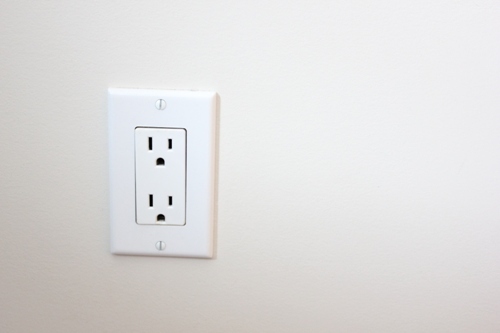 I noticed a lot of negative comments on the air freshener–you can always get one that plugs into the wall, like a Scentsy, so they can choose to use it or not! Great idea, I love Scentsy!! I would include disposable drinking cups. I have a dedicated guest room and put a stack of those in the pretty bath cup that goes by the sink. That way, people can use the individual ones and not have to share:). I also agree on the face cloths. I have even seen people get dark ones and embroider them with make-up or something . . . or just label them. 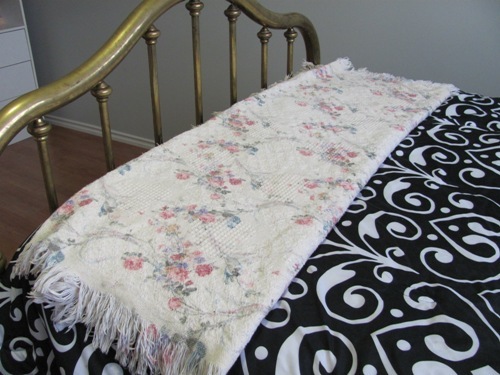 That keeps makeup stains off your pretty light colored towels. Love the list! Did how about el-cheapo slippers? I know this is something I often forget to pack and am so thankful when hosts have some extra. I started keeping some for just my regular visitors. You can buy them so cheap at places like Ikea or the dollar store. This is nice especially if it’s winter. Great ideas! I’d also add a copy of your house key so guests can come and go as they please. Great list 🙂 I think the sockets are more important than we think, especially near to the bed if you want to plug things in to charge etc. Also, depending how well you know your guests, your wi-fi password can be v.useful! I feel awkward asking for it, but handy to be able to connect your tablet/netbook/laptop or whatever. Huh, I thought someone else would have said this by now, must just be me. I now provide a small fan in my guest room, simply for white noise. I’m used to sleeping with that, and if I don’t have it, I can’t sleep well. After suffering through a weekend at my moms, I put a fan in every room someone might sleep in. Bottled water by the bed, feminine hygiene products in a basket in the bathroom, some magazines, laptop to use, extra TP in bathroom, extra pillows on bed. Glad I saw someone suggest a small fan. I actually travel with one, because I can not stand still air. I can be in a huge room, but still air makes me feel insanely claustrophobic. I already incorporate most of these ideas in my guest room. Usually it’s just my grown kids who come, or my or my husband’s siblings, so they are comfortable rummaging for snacks in the middle of the night, though I will add water bottles to the room. I also have a dresser in there that usually has extra sheets and some other stuff in it. I box that stuff up to give them a couple of drawers. I also have a small chair so they can put on shoes or at least have somewhere else to sit besides on the bed. I also happen to have a tv/dvd player in there, so I realize I should have a sheet with basic instructions on how to operate the remotes and what channels are available. Thanks for the reminder, tho. Thanksgiving is next week and our daughter and her hubby and our granddaughter will be here. I also have a shelf unit that I keep children’s books and legos on for the little one. I also like to have a couple of empty drawers for guests to use if they are staying more than a day or two. For shorter stays, a luggage rack is nice to make it easier to access their things. We include a hot water bottle (it’s cold here!) and a little card with our wifi name and password. I would leave a basket of tylenol or advil; some tums, and other otc meds people might forget but could use. Travelers diarrhea can hit a person so imodium can be a blessing too. If you have travelers from abroad, a converter for the outlets is helpful. Also, if you have internet users, provide a card that has the wifi password written down. We give our guests a house key and code to the alarm. This is such a great list! I’m tempted to see if my mom will let me decorate their spare room as a guest room for when we visit. Snack basket had never thought of that! I always include extension cord for those extra electronics we all seem to have. Also, the wireless password. Bottle of water or 2. I’ve found it handy to include a little notecard with our wifi information on it. How timely! My MIL is visiting us now, and I had most of these things covered. In a couple weeks we have some friends coming to visit and you’ve definitely given me more ideas. They haven’t stayed with us before so some additional things would be in order – things like the wifi password, tissues (d’uh), toiletries (just remodeled the bath and forgot about those), and snacks. I do have a luggage rack, an alarm clock, and fan. Those are really nice to haves. Another thing which you didn’t expressly mention in the list – a place by the bed to lay glasses/book. I have visited friends and family sometimes where there is no bed side table. as someone who wears eye glasses, its really a pain if I have to get out of bed to find them! I also found years ago that its handy to have a second set of towels and sheets handy in the spare bedroom. Sometimes guests like to change things more often than you do, or there is a need to do so, and this way they are free to do so on their schedule. And of course if you are fortunate to leave by the sea like we do, beach towels, sunscreen and after sun care are essential! Great tips! I have one to add though. Blackout curtains for the windows! I made the mistake of placing white sheer curtains in my guestroom and my guests were unable to sleep in because they were used to a really dark room. Yes! This is huge. We live in a condo and have large floor to ceiling windows. So this was a must in order to ensure guests had privacy. Or blackout/sleep masks if you can’t afford new curtains. I always take mine when I travel and find it hard to sleep if I forget! I love all your suggestions. One thing I do is leave a selection of pre-stamped postcards featuring my town or just silly ones so my guests can send quick notes to loved ones back home. Such great ideas! We’re having company on Friday- I can’t wait to wow them with some of these ideas. Thanks for sharing! 1. Extra pillows – couldn’t read in that bed without more props against the metal headboard. Choice of hard and soft pillows, down or poly. 2. A nightlight placed where it helps guide the way to the bathroom. 3 A flashlight if the power goes off! Nothing worse than being in a strange place in the dark if you need to get up in the night. 4. Reading material – current magazines, short story collections. 5..Throw open the windows for some fresh air even in winter, before the guests arrive. 6. Some sort of firm, straight chair or small bench – it’s hard to put on shoes and socks sitting on the edge of a bed. If you have room, a little luggage rack for opening up a suitcase is a big help and keeps dirty luggage off your bedspread (the little bench can do double duty for luggage). All things I’ve missed, and needed, when away from home. We have a couple of dedicated guest rooms and bathrooms because we live in a tourist magnet town. Every once in a while I’ll spend the night in a guest room just to make sure it’s comfortable, that the morning light can be blocked, and that the bathroom is in working order. I always like to have a basket of brochures for local attractions and local maps so that they can go sight seeing. That way they can figure out each night what they want to see the next day. I like to put fresh flowers and chocolates in the room if I know they do not have allergies. A tv and books/magazines ready with a nice chair is also good. 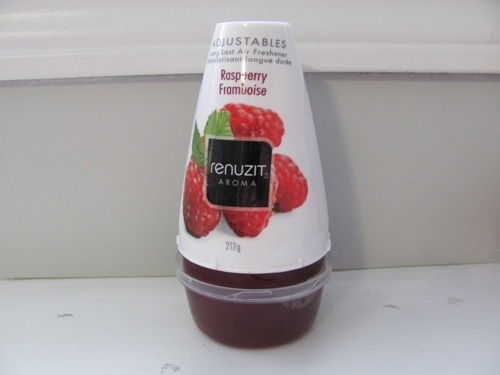 I also have the flameless candles that are battery operated, so that when they go up to bed or get up in the night, they are on….. If no allergies, I always put a bud vase with a flower or two. A pad of note paper and pen are a must. My guest bath is at the head of stairs, so I leave a strong night light to prevent falls. Mint on the pillow is always fun. Little stickies around the room, saying sleep in or help yourself in the kitchen. A hair dryer in the bathroom and a small TV or radio in the bedroom. Good idea, Lauren, about the hair dryer. Most people don’t travel with them, but we know how important they are!! This is a great idea for my guest bathroom. I found your helpful hints extremely helpful, and well thought out!! Thank you very much for sharing, from Texas! I am so glad I came across this post in Pinterest! Have an absolutely wonderful day! We call our guest room “Kate Lumbley’s room” (check out “The Enchanted April.”) I have a note from Kate telling the guest(s) how happy she and our family are that they are here with us (even though she is fictional and, if you know the movie, will never use the room). I also include wi-fi info and an overview of any plans that we have for them during their visit. If a family member is being displaced, the guest can feel a little funny about that. A note from the room’s full-time occupant puts them at ease and let’s them know that they’re welcome by that person. My kids loved your ideas.. Sticking to a hotel type theme..When grandma and grandpa came to stay we did a surprise “turn down” service. The kids took turns leaving cute love notes and treats on thier pillows! Thanks for the great ideas! There were several I had never thought about. I have an insulated pitcher I try to remember to put ice and water in so guests will have cold water. I also have a nightlight in the room, if wanted. I just read a hint to hang tags labeled “guest”, or whatever you with, so they will know the drawers are empty and ready for them to use. Thanks again. Great ideas! I have most of these items already, but our guest room is still a work in progress. Living in dry Wyoming, I keep unscented lotion on the bed side table, along with one of those handy table lamps I purchased at Target(?) that has an organizer for a base, a built-in extra outlet for charging phones, and a light that swivels. I keep pens, notepads, flashlight, bookmarks, stamps, etc, in the organizer base, and I keep spare phone chargers and a travel pack of fragrance free baby wipes in the drawer underneath. We also have a mini fridge in the room stocked with bottled water, snacks, and other drink options. It’s also the perfect height for a suitcase to sit on top for handy access. And next to it is a small trash can. Nightlight, small flashlight, notepad/pen, bedside carafe, small clock. You know what I love most about this post? You took pictures of a normal room with not everything perfect! Normal blankets and desk decor, and a normal amount of “stuff” in the room like any normal house has. Too many women are buckling into discouragement over not having *perfect* looking houses with everything the way Oprah (a single woman with a staff to suit her whims) and Martha (a single woman with a staff to suit her whims) does it. So I appreciate it when I come across a picture that is as normal and yet welcoming and thoughtful as this one. I have a 2 cup coffee pot in my guest room as well so my guests can have their coffee in the morning at there leisure. Saw your article on Pintrest! Thank you for covering so many little, often overlooked, items. Our Guest Room is under renovation, and this gives me some new ideas. Thanks again to you and your commenters =}. 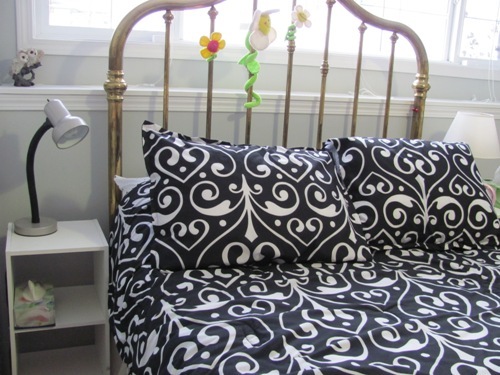 Thank you for the great article and all the helpful ideas…I do have one question…I have switched out the queen bed in the guest room for twins (tween gsons use this room)…would it bother you and your partner to stay in a room with twin beds? TIA for answers. My husband and I would not mind at all staying in a room with twin beds. It’s part of the fun, part of the novelty. I love the idea of a framed picture of the guests! I live in Ecuador and my guests are generally from North America or Europe so I always have guide books as reading material, ie: Lonely Planet, etc. Always flowers, WIFI code in a small frame on the desk. I purchased towels and had “guest” monogrammed on them. I also have “guest” written on the cupboard and closet that are empty. Thank you so much for this post. I am starting an AirBnB and couldn’t find anything to put the toiletries in. Those baskets are a great idea and not too expensive. I will buy bottled water as well. I have put a fridge upstairs and was going to put some food and perculated coffee in it at cost price and have put in two coffee plungers and froth jugs so no-one has to come downstairs for real coffee. I’ll also I make sure I put cleaning products in the bathroom. Don’t know where to put the extra pair of sheets if they want to change them? I need to somehow charge them for washing the sheets, especially if they want them changed everyday. A night light and torch are also a great idea. AirBnB is a worldwide site for travelers, who rent out a room in your house. It’s much less expensive than a hotel. I live in a tourist area. I had a motorbike accident so need to bring in some money but want my guests to feel comfortable.and special. The suit case racks are quite expensive – does anyone have any ideas? Postcards are a great idea, I can get heaps of them from the Art Gallery but forgot keeping some stamps available even though the Post Office is just up the road. I have spent heaps on setting this up and haven’t opened yet because I’m a bit of a perfectionist and need to find a good housekeeper. Thank you from the Gold Coast, Australia. I print guests names on a heavy piece of poster paper, cut it out in a cute shape and pin it to the guest towels. I leave a one size fits all light robe on the back of the door. With luggage weight so tight on planes, most guests don’t bring a robe. This makes it so they don’t have to dress to come to the breakfast room for coffee. I also add a couple of books about our area- history, tourist spots, cultural venues, etc. Oh I love the robe idea, I’m definitely going to do that too! I leave a list of “house quirks,” in the guest room, such as: the hot water is VERY hot, the radiator pipes bang and clank, the toaster and microwave can’t operate at the same time because a fuse will blow. and it’s OK if the cats go outside. I put a power strip near the bed, with all the outlets available. I also got a photographic history of my town from Arcadiapublishing.com. so guests can leaf through it. I put out a brand new box of Kleenex, some fresh flowers, and a “Welcome So-and-So!” sign. Those are some excellent tips!